If you are planning an extension to your home to either create more space, or add value to your existing property, choosing timber frame for the structure will allow for a quick build-time with a weatherproof and secure structure in place much faster than other construction methods. Timber is an environmentally friendly material with excellent insulation properties meaning your new extension will not only be eco-friendly, but super energy efficient. Timber frame extensions can be added to almost any type of house and the external finish can be selected and applied to either suit your existing home, or with a contrasting finish to really stand out. We have included below some of the different styles and external finishes our previous clients have chosen for their extensions. Depending on the final specification for your extension project, the timber frame structural elements can be installed within a matter of days, meaning roofing works can be scheduled in advance and commence immediately which in turn allows for internal works to start once your extension is in the dry. Since an extension is to your existing home, which is usually where you continue to live during the works, using timber frame as the construction method will reduce the disruption due to the speed it is installed as well as the benefit of off-site construction meaning very little to no waste at all left on site. Your timber frame structure can be produced in any style and will blend harmoniously with your existing home whether it be brick finish, render or wood. For a really stunning extension you should consider our Oak Frame solutions where we combine the beauty of oak with the cost effectiveness of timber frame. 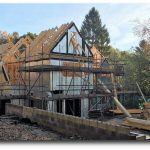 Take a look at some of the extension projects we have undertaken for our clients – https://www.timber-frame-suppliers.co.uk/our-blog/extensions-articles/. We can provide a complete design and build service looking after all aspects of the architecture and construction depending upon your location in the UK. We can quote to build your extension to your specifications and designs. We can work with you (self build) or your chosen builder to supply and erect (if required) the timber frame structure. Give us a call on 0118 971 2181, email us or send us your design using our contact form. Click on the button below to find articles about timber frame extensions. We wanted to extend our 2 bed bungalow so that we can start a family and after much research found Vision Development. We are first time self builders and from first contact, Vision made it very easy for us to get our head around elements within our build. The structure was assembled within 3 days from delivery date and the site was left tidy. The service was excellent throughout and it has been great to deal with a local family run business who really cared about our project. I would highly recommend Vision Development for anyone looking to self build be it first time or seasoned builders. Thank you Tim and team for your efforts. We had plans to build a sizeable extension to our home and chose Vision Development South Ltd to do the job. The project was carried out with skilled courteous tradesmen who worked non-stop in all weathers and the office staff were always on hand. The transformation is amazing and I am delighted with the finished works. We have recently had a two storey extension from Vision and would like to say that, we cannot speak highly enough of this company, from the friendly family feel when we visited them before placing an order, right through to completion of the building. Roy, and his team of Christian, Nathan, Paul and Ben were on site every day at 8am and worked their socks off, even on the first two days when the heavens opened they still ploughed on, nothing was to much trouble and what a fantastic job they have done for us. The whole process has been a pleasure and we would like to thank all at Vision Tim, Lucy and everyone for your help guidance in making it a pleasure. We will be back for our next project. From the outset it was clear that we had made the right choice in using Tim and his team at Vision.Tim’s vision, values and high standards run through the whole company whether they be in the office, the workshop or on site.Vision have restored our faith in the building trade.It really has been a joy and a pleasure for them to be involved in our project and we are sorry that their part in our project is at an end. The coffee machine is always on and you are all, always welcome in our home.